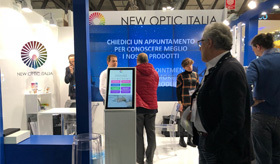 Our 'virtual oracle' I-Dea promoted the products of the company New Optic Italia at MIDO, the international fair on optics and eyewear in Milan Rho from February 24th to 26th. Record data were recorded during the three days of activity, with almost 200 interactions. I-Dea has shown the public a broader overview of the products of the NOI eyewear company, guiding users to the autonomous research of the desired product and giving an insight into the vision of the Italian brand, with the projection of explanatory videos on a large screen. 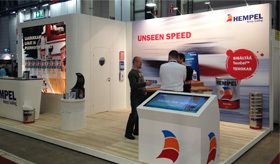 The I-Dea digital solution proved to be perfect for a chaotic context like the trade fair, offering itself as an excellent support to the staff for the exhibition and the sale of products. 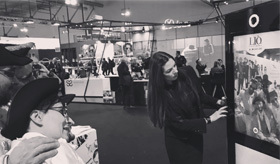 From February 24th to 26th ME The Selfie Machine was installed at MIDO, the international eyewear and optical fair in Milan, for the Italian company Liò Occhiali. ME entertained guests at the event, recording hundreds of selfie a day, but above all ME promoted the latest collection produced by the brand, the eyewear XXIsecolo. The glasses were worn by visitors before taking their selfie, captured in black and white to respect the colors of the campaign, a move which produced fun, visibility and engagement on social media. ME has not only been the testimonial of the launch of the new campaign, making users the real protagonists of the promotion, but also a symbol of the rebirth of the Made in Italy pride, an important topic which wants to reaffirm and above all emphasize the combination of economy and quality, which is a priority to us. From February 16th to 19th Me The Selfie Machine was installed in Antibes, for the twelfth edition of the Pain Amour et Chocolat fair. 14,600 visitors attended the event, and ME has entertained them by collecting hundreds of photos in three days. The event held in Antibes is the second stop of the ME The Roadshow after the debut of the promising project at the Sanremo Music Festival. The Festival of Sanremo 2018 marked the first stop for ME The Roadshow project, a list of 20 events in which ME will participate as a protagonist. Me The Selfie Machine was installed at Casa Sanremo, the Palafiori next to the Ariston Theater, where it entertained thousands of visitors at the Victory Morgana Bay stand. 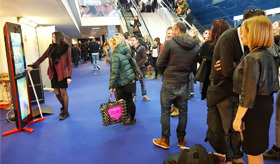 The presence at the Sanremo Festival has been a success, hundreds of shots, 200 selfies registered on the last day of the event only, a great participation and engagement on social channels. The traveling project, ME The Roadshow, will continue with a stop in Antibes on February 16th for the event Pain, Amour et Chocolat. 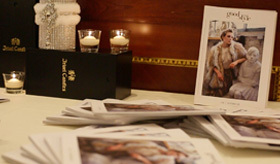 On February 2nd the "Style Affair" Cocktail Party was held in Venice, in partnership with Auleum and Goodstyle Magazine. 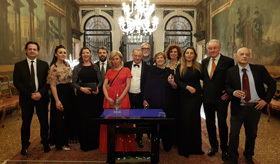 The elegant setting of Cà Sagredo, 5 Star Hotel next to the Grand Canal with its precious and decorated interiors, has been the background to the evening with guests like Marchesi Antinori and the stylist Anita Pastzor. TaBi was the protagonist of the event, which exhibited Auleum, the Golden Oil of gastronomic excellence Made in Italy, and its production process. TaBi has enchanted those who were at the event, involving them in a sensory experience and giving that magical touch to the refined and characteristic atmosphere of the Venice Carnival, an event known all over the world. 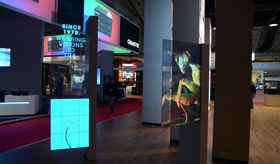 Some people from our team of developers took part at the ISE2018, event which was held in Amsterdam from February 6th to 9th; a trip which was an update on latest technologies belonging to the smart surfaces and object recognition field, such as virtual mirrors, augmented and transparent and deformable screens. It's been a great opportunity to organize a series of events with some of our partners, including Advantech and Sharp, and stay informed about changes and innovations in the market. 2018 is the year of ME The Selfie Machine, the sponsorship and entertainment tool that uses the Selfie to promote brands and events on the territory, collecting important data for marketing campaigns at the same time. 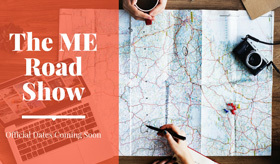 On the first few days of February will start ME The Roadshow, a path of 20 events articulated on national and international territory, between Liguria, Piedmont and Côte d'Azur: events belonging to different cultural sectors, from gastronomy, to entertainment. A great opportunity for brands and sponsors who want to gain visibility and engagement from the participants: ME indeed doubles the engagement and the social traffic, increasing the organic followers by over 10%. The first event on ME The Roadshow list will be held in Sanremo, where ME will be from February 6th to 12th, to entertain thousands of guests at the famous Festival of Italian Song. SPX Lab has recently started a collaboration with the Italian editorial of luxury and trend: Goodstyle Magazine. After the Lusben Xmas Party in Livorno, the next event will be held on February 2nd at Ca 'Sagredo, 5Stars Hotel in Venice, next to the wonderful Grand Canal. We will exhibit TaBi, our jewel of Hi-Tech Interior Design, a surface that recognizes the product by touching it and magically tells its story. Together with Goodstyle Magazine along this promising 2018, we will bring our products to prestigious national and international places: from Portofino next June, to the Cannes Yachting Festival and Monaco Yatch Show in September. Follow us and let yourself be captured by magic. SPX Lab started a collaboration with Noi Occhiali, New Optic Italia, the 100% Made in Italy brand, on the occasion of MIDO, the international fair for the eyewear and optical sector, held in Milan Rho from February 24th to 26th, with I-Dea, the interactive creative solution made for assisting the customer along with the whole purchase process. I-Dea is a "virtual oracle" that, through a touch screen, helps the customer in choosing the product that best suits his needs, thanks to the data collected following some targeted questions, asked in order to find the perfect solution. 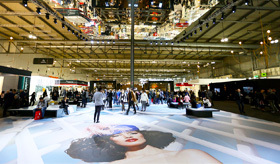 In a context that may seem chaotic such as an international fair, I-Dea proposes itself as an aid to exhibitors, because it allows visitors to independently learn about the brand's offer and receive a personalized consultation on the article that best suits their tastes and needs. This 2018 marks the fifth consecutive year of the successful collaboration between SPX Lab and the leading international company in the luxury yachts and ships sector, Hempel; a result that we are proud to underline, with regard to the growing importance of one of our most loyal customers on the market. Hempel has chosen our product, Expo, the interactive touch screen that illustrates items and services as an elegant digital catalog, to display their products all over the world. There are several events and nautical fairs in which Hempel will participate in 2018, showing its brand through Expo, starting right in few days, with the first appointment from January 20th to January 28th at the Dusseldorf Boat Show. Expo will then follow Hempel in a world tour: in Helsinki ( February 9th-18th), Stockholm (March 2nd-11th), Oslo (March 14th.18th), the Cric Boat Show (May 26th-28th), the SWC (July 30th-August 12th), South Hampton (September 14th-23rd), Barcelona (October 10th-14th) and finally at Mets (November 13th-15th).